Eighty years ago, on May 20, 1927, a 25-year-old airmail pilot named Charles A. Lindbergh departed Roosevelt field in New York and flew a modified Ryan monoplane solo to Paris, France. The flight lasted only 33 hours, but Lindbergh had enough fuel to fly over 40 hours if he drifted off course and found himself anywhere from Norway to North Africa. The plane was named “The Spirit of St. Louis” after a group of St. Louis businessmen who financed the venture. The Orteig Prize of $25,000 was established several years earlier for the first pilot to fly nonstop between New York and Paris. The number of accidents was accumulating with two famous French WWI pilots Nungesser and Coli already overdue from Paris to New York when Lindbergh actually launched for Paris. The “Spirit” was built in San Diego after Ryan Aircraft returned a telegram to Charles Lindbergh advising that they could build (in less than 90 days) a single engine airplane capable of flying across the Atlantic Ocean for $15,000. 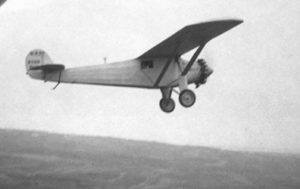 Major design modifications were made to the Ryan Brougham by Donald Hall, the chief engineer of Ryan Aircraft. The wings were extended to provide more surface area and the landing gear strengthened for the extra weight. The fuselage was extended to carry three-quarters of the 450 gallons of fuel in front of the pilot to increase stability. A periscope was added to minimize looking out the side window in the cold slipstream. There was no windshield, but there also was not much air traffic over the Atlantic in 1927. Lindbergh stayed in an apartment that still exists in San Diego a few miles from the Ryan factory to supervise the construction. The Spirit had a gross weight of 5100 pounds with full fuel. The engine was a state of the art Wright J-5 Whirlwind 225 HP Radial that had a special gold plate inspection. 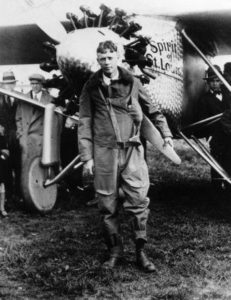 The Spirit was completed in 60 days, and Lindbergh set a speed record flying to New York with a stop in St. Louis to thank his supporters. To navigate, Lindbergh had drawn out a great circle route on a globe and then transposed that course route onto charts. Since the Spirit cruised at about 100 mph, the heading was adjusted each hour for both the route and winds observed from waves on the ocean. The long wings and small tail made the Spirit unstable in the roll axis, which required constant hands-on flying thus helping to keep Charles Lindbergh awake. There were also distractions from icing, compass problems, and never accurately calculating the strength and direction of any crosswinds. However, the navigation errors luckily averaged out and the Spirit arrived over Dingle Bay, Ireland on the morning of May 21st right on course!!. The navigation technique of maintaining a course over time is called “dead reckoning”. Lindbergh depended upon the method, but didn’t appreciate the description! From Ireland, navigation was a “piece of cake” cruising over the English countryside and following the Seine River towards Le Bourget Field. By then, the whole world was watching and waiting along with thousands of cars and headlights creating confusion over The nighttime landing field. A very exhausted Charles Lindbergh landed the Spirit of St. Louis on the grass field 3000 miles from takeoff and just a quarter century after the first powered flight under control in 1903!